Director John Hillcoat (‘The Road’ and ‘The Proposition’) has a new film coming out this year that’s spending a little too much time under the radar. Hillcoat’s new film ‘Lawless’ (formerly known as ‘The Wettest Country’) is set in America during the prohibition era and tells the story of three brothers who produce and run bootleg whiskey out of Franklin County, one of the most whiskey-rich counties in the country. Not only do they have to protect their business from the Alcohol Tax Unit, but also thieves, cops, and attempts at exploitation from county officials. It’s based on the novel ‘The Wettest Country’ by Matt Bondurant and boasts an impressive cast that includes Tom Hardy, Shia LaBeouf, Jason Clarke, Jessica Chastain, Mia Wasikowska, Guy Pearce, and Gary Oldman. 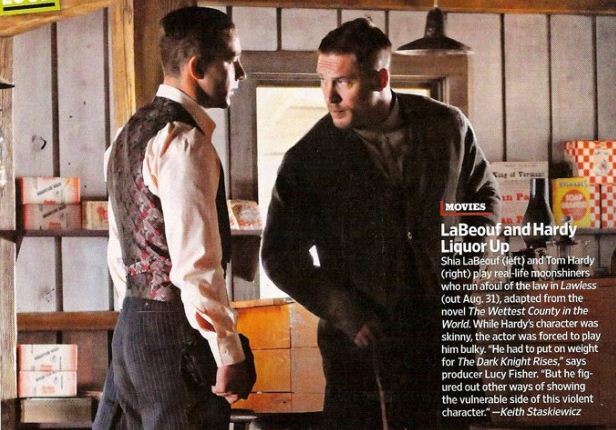 An official image has appeared online of LaBeouf and Hardy via EW, The Film Stage and The Playlist. Hit the jump to check out the full image. ‘Lawless’ is released 31 August 2012 in the US and 6 September 2012 in Australia.